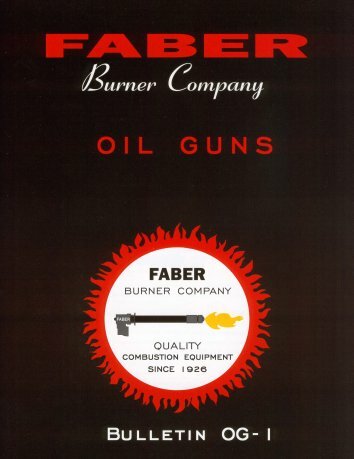 Faber Burner Company has a complete line of oil guns, ranging from 2.1 to 200 MMBTU/Hr. heat input. Any liquid fuel may be burned with either steam, air, or mechanical atomization. All steam and air atomized oil guns have a high turndown ratio, typically greater than 8:1. Gun model, length, and atomizer size and type are selected based on your application. To download our bulletin in PDF form please click on the image to your left. 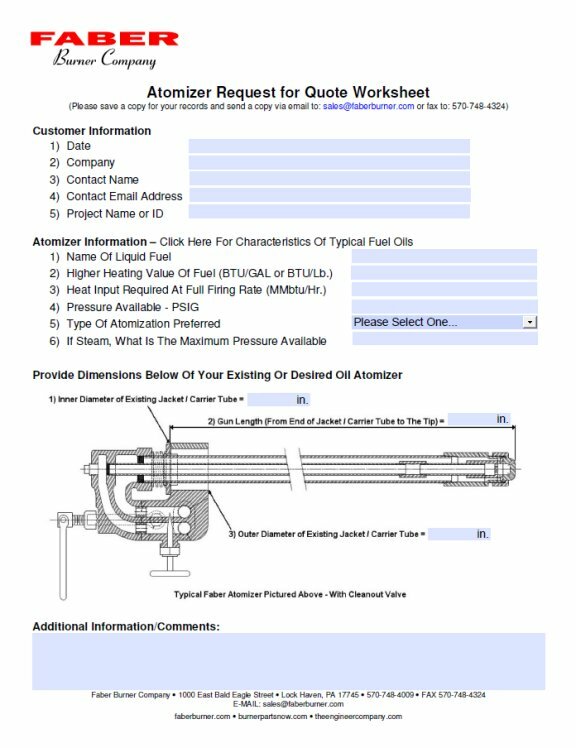 To download our Atomizers Request For Quote Worksheet in PDF form please click on the image to your left. The conversion of an existing Faber Burner that presently fires No. 6 fuel oil to fire No. 2 fuel oil is relatively straightforward and simple. No. 6 fuel oil requires preheating of the oil due to its higher viscosity, and it also offers some lubricating properties for the fuel oil pumps. No. 2 fuel oil does not require any preheating and is fired at an ambient temperature. NOTE: (If the No. 2 fuel is stored above ground in a cold climate, some heating may be required in order to keep the fuel oil from becoming a gel at very cold temperatures). Ensure that the fuel oil pumps, in the system are satisfactory for pumping No. 2 fuel oil and, if so, verify the pumps capacity and pressure output when pumping No. 2 fuel oil. NOTE: (Normally, a pump designed specifically for No. 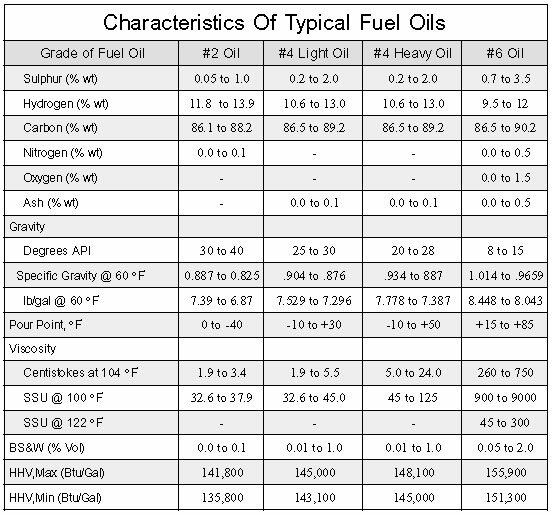 6 fuel oil cannot be utilized for No. 2 fuel oil due to the lack of lubricating properties of No. 2 fuel oil. Some pumps are designed for either fuel; however, the pumping capacity while on No.2 fuel oil will be reduced as compared to No. 6 fuel oil). 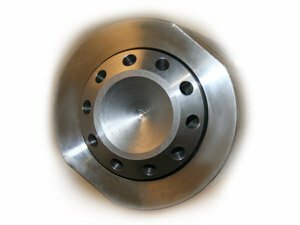 The strainer baskets in the fuel oil pump set should be 1/16″ diameter holes. NOTE:(Due to the cleaning properties of No. 2 fuel oil, any deposits left over from the No. 6 fuel oil will very likely be cleaned away from the tank and piping wall. Therefore, it is advisable to circulate the No. 2 fuel oil through the strainers and back to the tanks for a time period as determined by how dirty the strainers become). Since the No. 2 fuel oil does not require preheating to burn, the temperature limit switches on the burner assembly must be either removed and a wire connected between the two terminals or the switches can be left in place and a jumper wire put between the two terminals to bypass the switches. A new oil gun assembly with insulated inner-barrel is required. New tips and plugs for the oil gun are not specifically required. However, if the existing tips and plugs have any wear, it is advisable to buy a completely new insulated oil gun with new tip and plug. A new orifice bushing for insertion in the burner assembly insert is required. This orifice bushing screws into the existing insert. Tune the burner assembly after the switch-over to No. 2 fuel oil to ensure optimum performance and efficiency from the burner. A burner service engineer is available from the Faber Burner factory in Lock Haven, Pennsylvania, to accomplish this tuning. In order to maintain optimum performance and efficiency from the burner/boiler assembly, yearly tune-ups are recommended.